What a year it’s been for us at CA Math & Science Challenge. Our mission to empower teachers with effective sTEm curriculum has begun in earnest with schools throughout San Diego County. For instance, Ms. Bolling, the new head of the robotics program at Innovations Academy Charter: using a curriculum that included our Challenge Trees and Coaching/Assessment Checklists, Ms. Bolling helped every K-8 child experience some level of robotics programming at Innovations. 2nd Graders receive instruction for LOGO based Probot robots. We have continued to support the wonderful teachers in our Hoover Cluster as they strengthen their own robotics Robotics programs. The very exciting Southern California Botball Regional Tournament., held at USD. Hoover cluster students participate to work against nothing but the clock as they solve up to 6 different C coding challenges in 3 hours’ time! 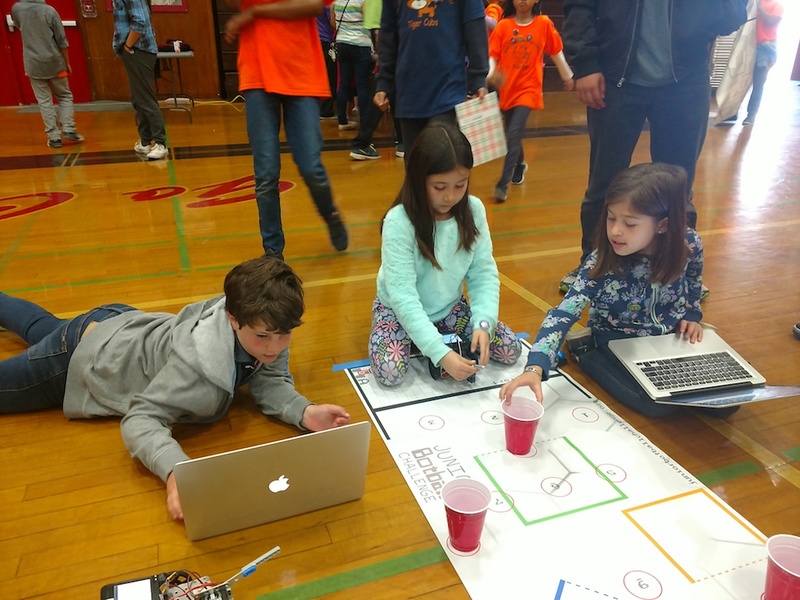 Same great program…different students and different programming challenges at the SD Botball Regional Tournament! The 2018 Global Conference on Educational Robotics (GCER) was held July 25, 2018 – July 29 at the Hyatt Regency Indian Wells Resort & Spa in Indian Wells, California. Thank you to USD Engineering for hosting and to all teams and mentors and volunteers for another great San Diego BotBall Challenge! Students from ages 6 to 18 spent the day solving coding, applied mathematics, and engineering problems… time flies when you’re having fun! ⇒ Let’s get our kids in the game! 11 Jr Botball Challenges to Solve • Botball @ USD! See you April 21st @ San Diego Botball & Jr Botball Challenge! Jr Botballers: Get ready to teach your robot to solve these challenges! Jeff Major hosted a training for Teachers and Team Representatives from Grades 6 – 12. 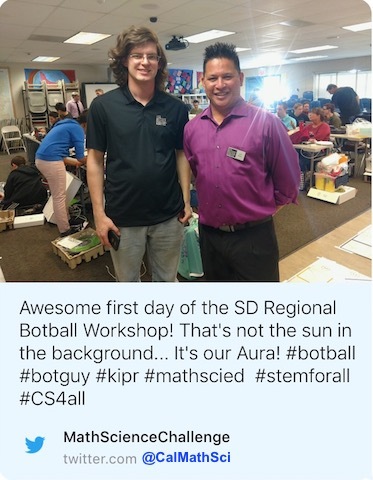 Special Thanks to the San Diego Rotary Club STEM Committee for their support! Early Learning Advantage!™ ⇒ Programming • Problem-Solving • Applied Mathematics! Students: drop by to “Take the Jr Botball Challenge” any time between 9 AM & 12 AM. This event is open to all registered Junior Botball® Challenge teams. Registered teams do not have to pay an additional fee to participate, but each school’s Botball coordinator must complete the sign-up form for this event (link below). There are 6 Challenges at this event: Challenges 1, 2, 5, 9, 11, & Dance Party Challenge. Challenges 1, 2, & 5 are for the beginner level, Challenges 9 & 11 will be for the intermediate level & the 6th challenge will be a mystery revealed onsite. JBC Challenge 2: Ring Around the Can (beginning)- The robot will drive out and around the can in circle 6, and return to the starting area. JBC Challenge 1: Tag You’re It (beginning)- The robot will drive to the can in circle 9, touch it, and return to the starting area. The California Math & Science CHALLENGE! A Science and Information Technology Program modeled on the US Olympic Development Program. Step 3: Get them World-class Coaching as they prepare for Tournaments, Active Learning Design™ Contests, and Home Learning (Online Mastery) Challenges. In this ⇒ Video Clip two students on the Arts & Sciences Academy Robotics Team solve the “Serpentine Challenge” in Saturday’s Junior Botball Robotics Tournament in San Diego. STEM Director at Innovations Academy Charter School and Arts & Sciences Academy. Director of Training and Tournaments at the non-profit CA Math & Science Challenge. The Arts & Sciences Academy Robotics Team of Dharma and Martina were the ONLY team to solve all 5 challenges in the tournament! (their code is below the “read more” tag) Arts & Sciences Academy student Max, arriving near the end of the morning also finished 4 out of 5 challenges before running out of time! Since the weekend’s tournament the MISD robotics team students have moved on to the second level of Jr Botball: Learning about Sensors, Light Energy & the Electromagnetic Spectrum, Digital vs Analog inputs, and more…! San Diego BotBall Tournament: Engineering Prize Winners!